Record companies can be strange, especially when different strategies are employed in different territories. 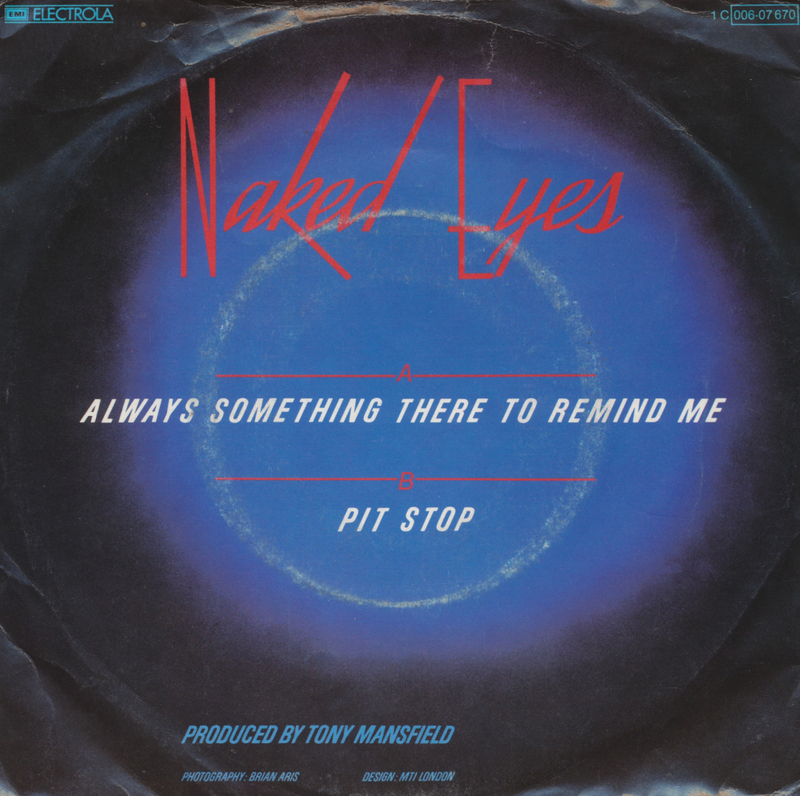 In the UK, EMI released Naked Eyes' 'Always something there to remind me' in a perfectly great picture sleeve featuring a photograph of the band, but somehow EMI in Germany decided to use the same design while omitting the photograph. I thought the difference was weird enough to make me want to have this version as well. Of course, the songs remain the same, so this is mainly an opportunity for me to repost the tracks. There's no mistaking the sound of producer Tony Mansfield on this single. It might well have been a New Musik track. Instead, it's Naked Eyes, with their second hit single 'Promises promises' (1983). At least, it was a hit single in the USA, where it peaked at number 11. Oddly enough, the British duo didn't manage to have a hit with this in their own country. The B-side features an early version of '(What) In the name of love', a track they would release as a single in 1984. 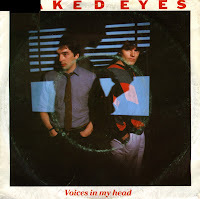 'Voices in my head' is a single taken from Naked Eyes' 1983 album 'Burning bridges'. Like most of their singles, this one wasn't successful: it did not chart in the UK, nor anywhere else. 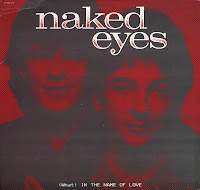 It was the first single by Naked Eyes that I bought, although I was looking for other releases such as '(What) In the name of love', the music video of which was shown regularly on television. 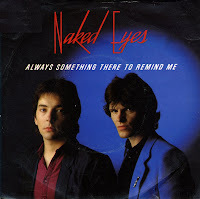 I had the 12" single of 'Always something there to remind me' by Naked Eyes years before I found the 7" single. The track was produced by Tony Mansfield, of New Musik fame. 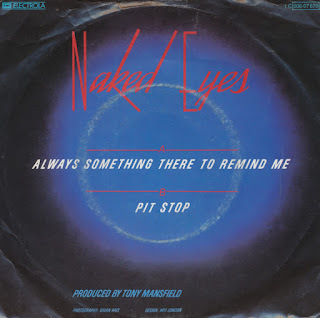 Released in July 1983, this single became the only (minor) hit for Naked Eyes in the UK. It peaked at number 59 in the UK singles chart. 'Always Something There to Remind Me' is a song written in the 1960s by Burt Bacharach and Hal David. Originally a minor hit for American singer Lou Johnson, it was then recorded by Sandie Shaw. It became her breakthrough hit in the UK in 1964, reaching number one in the UK singles chart. Naked Eyes recorded a cover version of this song in 1982. This 12" version was remixed by John 'Jellybean' Benitez. Watching music television daily can provide you with lots of new impressions. I learned a lot about the music scene in 1983 and 1984. When I saw this clip, I knew Naked Eyes was a group to watch. Two decades later, I own a compilation cd and several 7" and 12" singles by this duo. '(What) In the name of love' appeared on the B-side of the 12" single of 'Promises, Promises', but got released as a single a year later. The new version was produced by Arthur Baker. The 12" single I own was made in America, meaning that they were actually attracting some attention over there as well. Not bad for an English duo. 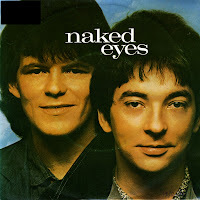 Naked Eyes was an English synthpop band, consisting of childhood friends Pete Byrne (vocals) and Rob Fisher (keyboards). The latter would continue his career in the second half of the eighties as one half of the duo Climie Fisher. 'Promises, promises' was their first self-penned hit in the USA, after their version of Bacharach's standard 'Always something there to remind me'. The extended version of 'Promises, promises' apparently features backing vocals by Madonna, although I never heard them... What's more interesting is that the B-side of the 12 inch features an early version of 'In the name of love', a track they would re-record a year later and have another hit with.